In this week's Abundance Insider: Self-assembling cellphones, Intel and Microsoft’s VR play, and vitamin-rich biofortified rice. What it is: Skylar Tibbits of the MIT Self-Assembly Lab has teamed up with design studio Marcelo Coelho to create cellphones that can build themselves -- no human intervention or advanced automation needed. Their rough prototype has six parts, and when placed into a tumbler, the phone can self-assemble in under a minute. The secret to attaching the parts and keeping them together is surprisingly simple: magnets of varying polarity. What it is: Ford has officially announced the company's plan to deliver fully autonomous cars to consumers by 2021. These cars will be designed without steering wheels, brake pedals and gas pedals, making it a "full Level 4 self-driving" vehicle -- meaning human drivers aren't required. Ford will staff up for the effort by doubling employee numbers (to over 300) and expanding operations space in Palo Alto. What it is: Intel recently unveiled Project Alloy, an open-source standalone virtual reality headset made in cooperation with Microsoft. Unlike competing headsets from Oculus and HTC, MIT Technology Review reports that Project Alloy lets users interact with virtual objects simply by reaching out -- no hand controllers necessary. Another fun user feature: Hold a real-life object in your hand, and the headset will generate that object in your virtual world. What it is: Uber plans to test fully autonomous Volvo XC90 sport utility vehicles in Pittsburgh in just a few weeks, making it the first to roll out self-driving cars for urban taxi use. Due to regulatory uncertainties and safety precautions for this pilot program, Uber will have a human driver in each Volvo, as well as a mandatory "opt in" from passengers to use the self-driving Uber cars. What it is: At a recent NASA press conference for its Journey to Mars mission, NASA Deputy Associate Administrator for Exploration Systems Development Bill Hill told the audience that NASA may relinquish ownership of the International Space Station. 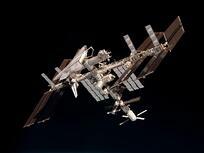 "NASA's trying to develop economic development in low-Earth-orbit," he said. "Ultimately, our desire is to hand the space station over to either a commercial entity or some other commercial capability so that research can continue in low-Earth orbit." What it is: Aircraft manufacturer Airbus is planning to build a self-flying vehicle platform for both passenger and cargo transportation, used by companies such as Amazon. Airbus' ultimate use for the platform would be to ferry passengers using shared autonomous vehicles. What it is: Researchers at Tel Aviv University are experimenting how VR integrated into a regular treadmill workout could help prevent older people from falling. The university's investigation stemmed from the idea that safely training motor and cognitive functions through video game-style VR would effectively reduce an older adult's chance of falling. What it is: University of Melbourne plant geneticists have developed a biofortified rice that contains 200% more iron and over 180% more zinc than conventionally bred rices. What's more, the biofortified rice doesn't have any downsides: it has the same yield as existing rice varieties, it won't cost any more for farmers to adopt, and it doesn't have any harmful effects on the soil or environment.